For the new icebreaker, see Arktika (2016 icebreaker). Construction of the ship began in the Baltic Shipyard in Leningrad on July 3, 1971. Sea trials completed successfully on December 17, 1975. For further information on the ship's design, construction and propulsion system, see Arktika-class icebreaker. In 1982, she was rechristened Leonid Brezhnev in honour of Leonid Brezhnev, the General Secretary of the Central Committee of the Communist Party of the Soviet Union from 1964 until his death in 1982. In 1986 the name reverted to Arktika, according to some accounts because the ship's crew disliked the new name and refused to respond to radio messages unless the ship was referred to as Arktika. Within a week of the strike, the name was changed back. Another explanation is that the original name change had been due to an administrative mixup, and the name Leonid Brezhnev had never been supposed to apply to Arktika at all, but had been intended for a different ship. The vessel was in service from 1975 to 2008, with the important goal of reaching the North Pole achieved in August 1977. Arktika was retired for several years,[when?] but was repaired in the late 1990s. Originally designed for 100,000 hours of reactor life, Arktika's service life was prolonged another 50,000 hours in 2000, and another 25,000 hours after that, adding eight years to a 25-year planned service life. The life extension was accomplished by means of replacing critical equipment to allow the safe and continued operation of the nuclear plant. On May 17, 2000, a conference of Russian engineers, scientists, and government officials took place on board Arktika after her first service extension. The extension cost only $4 million, compared to the $30–50 million cost of a new nuclear icebreaker, and proved to be a successful endeavor. The conference therefore concluded that the lifetimes of Russian nuclear icebreakers could be successfully extended to 175,000 hours, and possibly more. On April 9, 2007, a fire broke out on Arktika. The fire caused minor damage to three cabins and knocked out an electricity-distribution panel. The nuclear reactor was not damaged. There were no injuries. 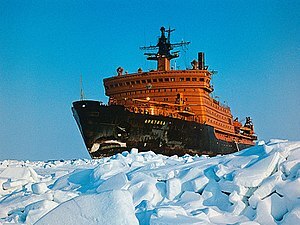 The icebreaker was in the Kara Sea when the blaze erupted, and was sent to Murmansk. After 33 years of reliable icebreaking, having become the first surface ship to reach the North Pole in 1977, and the first civilian ship to spend more than a year at sea without making port in 2000, and covering more than a million nautical miles by 2005, Arktika was retired in October 2008. She is docked at Atomflot, the nuclear base and dock in Murmansk, 1.5 kilometres (0.9 mi) away from the main docks, where she will remain until policies can be drawn up to dismantle her. In the meantime, she is a subject of important research, focused mainly on how to further extend the service life of the other Arktika-class icebreakers. There have been calls for the ship to be converted to a museum, either in Murmansk or St. Petersburg. An earlier Soviet nuclear icebreaker, Lenin, is already a museum ship in Murmansk. 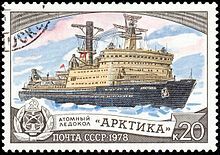 Wikimedia Commons has media related to Arktika (ship, 1975). ^ "Atomic Icebreakers Technical Data". rosatomflot.ru. Retrieved October 9, 2017. ^ Paine, Lincoln P (1997). Ships of the World. Houghton-Mifflin. p. 39. ISBN 0-395-71556-3. ^ Walston, O. (1994), Arktika. London: Reed Consumer Ltd.
^ (October 7, 2008). Arktika Rests After 33 Years of Icebreaking World-Nuclear-News.Org. ^ "Fire in nuclear-powered icebreaker", BarentsObserver. Published April 9, 2007. ^ "Arktika rests after 33 years of icebreaking", world-nuclear-news.org, October 7, 2008. Sevmorput is a Russian nuclear-powered icebreaking LASH carrier and container ship. Named after the Northern Sea Route, the 1988-built ship is one of only four nuclear-powered merchant ships ever built. After having been laid up in Murmansk for years awaiting disposal, the vessel was extensively refitted and returned to service in 2016. Lenin is a Soviet nuclear-powered icebreaker. Launched in 1957, it was both the world's first nuclear-powered surface ship and the first nuclear-powered civilian vessel. Lenin entered operation in 1959 and worked clearing sea routes for cargo ships along Russia's northern coast. From 1960 to 1965 the ship covered over 85,000 miles during the Arctic navigation season, of which almost 65,000 were through ice. 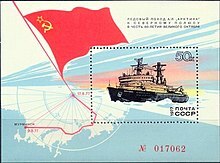 On April 10, 1974 the vessel was awarded the Order of Lenin. She was officially decommissioned in 1989. She was subsequently converted to a museum ship and is now permanently based at Murmansk. The Northern Fleet is the fleet of the Russian Navy in the Arctic Ocean. The Arktika class is a Russian class of nuclear-powered icebreakers. Formerly known as Project 10520 nuclear-powered icebreaker, they were the largest and most powerful icebreakers until the 2016 launch of the ship named Arktika. Ships of the Arktika class are owned by the federal government, but were operated by the Murmansk Shipping Company (MSCO) until 2008, when they were transferred to the fully government-owned operator Atomflot. Of the ten civilian nuclear-powered vessels built by Russia, six have been of this type. They are used for escorting merchant ships in the Arctic Ocean north of Siberia as well as for scientific and recreational expeditions to the Arctic. NS 50 Let Pobedy, translated as 50 Years of Victory or Fiftieth Anniversary of Victory, is a Russian Arktika-class nuclear-powered icebreaker. Sibir, built 1977, is a retired Russian nuclear-powered icebreaker of the Arktika class. She is the only icebreaker of her class that does not feature a red superstructure. Murmansk Shipping Company, often abbreviated as MSCO, is a Russian shipping company based in Murmansk. One of the primary shipping companies operating in Arctic Russia and northern Europe, as of 2014 the company has 303 vessels, with a total deadweight of about 1.2 million tons. 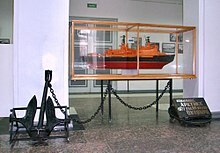 The company runs a notable museum in Murmansk.